Enjoying the local ambiance of Tiya Tinay’s. Tiya Tinay is very busy during this holiday season especially in the morning. Their kape-gatas is well sought by the locals. I am just a day away for my trip to my beloved Sorsogon. My wife and daughter will join me for another exciting drive down South. It’s one of the moments that we can bond together; visit new places (yes, sometimes we make a detour – by choice or by circumstances); eat in new restos and other fun stuff. This time of the year is also common for the readers to visit the articles about road trip to Sorsogon. Though mostly will take the Pan-Philippine highway from Manila. I am interested to know trying the road less traveled via the Manila East Road in Rizal going through Pagsanjan, and eventually entering Pagbilao. According to Google, it’s 10km shorter for me than taking SLEX; and not to mention the hellish traffic in Laguna! Maray na Pasko tabi sa Indo gabos! Turkmenistan tops all countries on December 7, 2014. Is this for real? 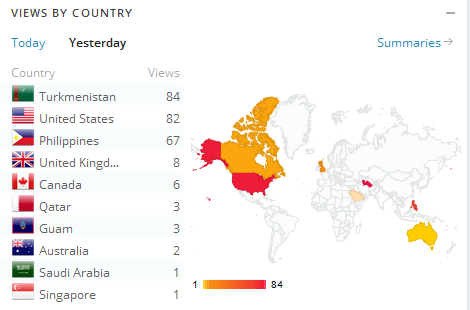 Turkmenistan generated the most number of hits for yesterday’s stats! I know I keep on breaking my promises to post more interesting topics. So, I won’t make any promises anymore. I will just post whatever I can, and whenever I can. Despite the weak activities on my side, visitors are still checking in. I find the comments from Tina and the rest on the historical landmarks of Sorsogon encouraging. That basically fuels my motivation not to let go of this site; it also helps that my wife supports me on this endeavor. Admittedly, I do think how I can monetize this blog without breaking the main objective of the whole thing. But with the little time I have left to spend on this hobby, I don’t have any progress beyond imagining things. The good thing of the mobile phones nowadays is that I don’t need a laptop to monitor this blog, or even post articles. I’ve been using WordPress Apps in the last couple of years and only this year that I posted a couple of articles via my tablet. On another note, I browsed the Wiki articles of Sorsogon province, Sorsogon City and the list of barangays of Sorsogon City. 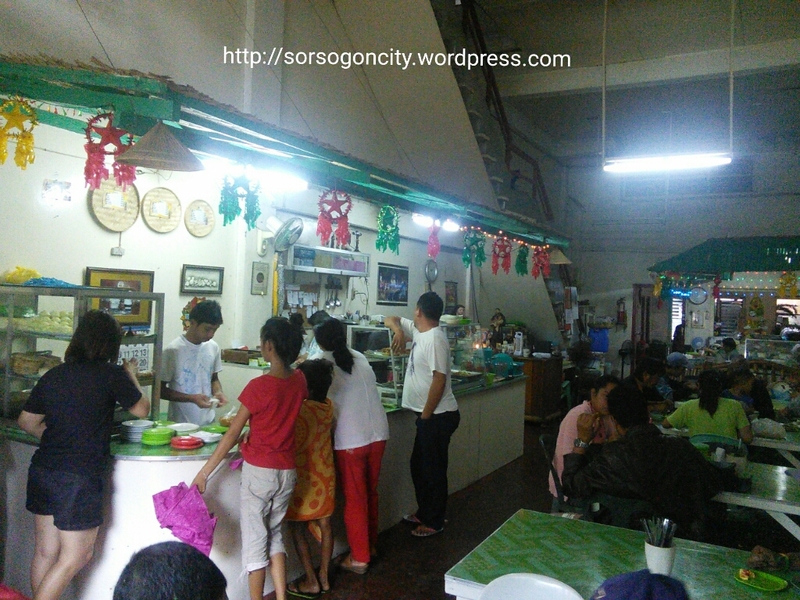 Lo and behold, the wiki for Sorsogon City went active! Before I am the only one editing it with some wiki bots. But now, additional content are being added, together with more pictures. Dios mabalos tabi kun sino man kamo na nag dagdag sin impormasyun sa Wikipedia. However, for those who are not complying with the Wiki policy, please refrain from providing inaccurate content. I am referring to this Wiki picture that the source claims its his own work. Dili na naalo! Well, time for me to go to work. I hope you enjoy, whatever articles I upload this year. Salamat tabi sa mga nagsimbag sa surat ko tungkol sa tamang contact information sa website. Maski papano, naitama ko na an iba na importmasyun sa website. Just sent several emails to the hotels listed in this blog. It’s unfortunate, one of the most popular – Sirangan Hotel – has no working website anymore. It’s really hard to sustain your presence in the web; take it from somebody who is maintain a blog on and off. Hopefully, the email addresses are still valid and the contacts will be prompt to reply back. I could have them leverage this site as a medium for their promos; with disclaimer, of course; lest, our dear readers mistake it as an endorsement. Part of my advocacy is maintaining the Wiki article on our beloved city and the list of its barangays. I just uploaded a couple of pictures and clean up the article on the barangays. Hopefully, I can still spend more time improving it. So far, reposting seems to pick up. I am reviewing some of my pictures in the last 12 months and share with the readers, especially those who haven’t been back for a while now. Wow! I never realized that I didn’t have a journal entries in 2014 until now. After several months of trying to get the groove back, only now that I was successful. Even reposting of articles simply slowed down this year! Worse, I wasn’t able to visit my beloved Sorsogon this summer. I am planning to visit on August though, to check some opportunities. Sa mga nagbibisita pa man gihapun maski wara bag-o na isturya, salamatunon tabi!